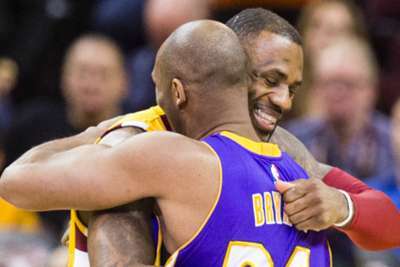 Los Angeles Lakers great Kobe Bryant told LeBron James not to give up and keep pushing as the NBA playoffs slip away. James arrived from the Cleveland Cavaliers amid much hype and fanfare, however the Lakers are 31-40 and set to miss the postseason in 11th position in the Western Conference. The three-time NBA champion has not missed the playoffs since 2004-05, while the Lakers have not featured in the postseason since 2013. Bryant pointed to the number of injuries the Lakers have had to overcome, including losing James (groin) for several weeks and shutting down Lonzo Ball (ankle) and Brandon Ingram (shoulder) for the rest of the season. "It was unfortunate because it got hit with so many injuries in rapid succession," Bryant said on ESPN's 'Get Up'. "When they were rolling, I mean, they were playing very well, I think exceeding people's expectations. "But then they got hit with all these injuries. Kind of set 'em back, knocked them off-kilter a little bit. It's hard to reboot that and so now they get caught in that rut. But next year should be better." When asked what advice he would give Lakers president Magic Johnson, Bryant said: "It's just a matter of being patient. Obviously they'll make smart decisions. "You have opportunities, things, pieces that you can trade, assets of that sort, or you can stay with the young guys who are extremely talented and have great upside and let them develop. Either direction you go should be a good direction." As for what he would tell veteran James as he tries to turn the franchise around: Do not give up.